You never know what you’re going to find as you go through the family archives. Who needs the Nathan’s hot dog contest? 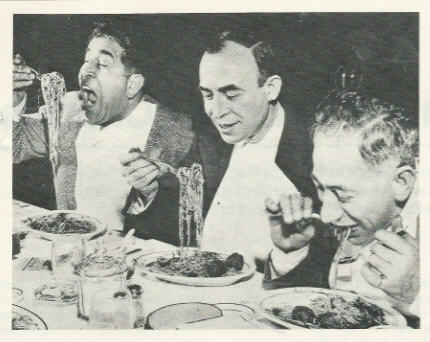 From the early 1940’s here’s bowling’s “Italian Connection” of Andy Varipapa, Hank Marino, and Joe Falcaro vying for their own spaghetti championship in a New York restaurant. Somewhat reminds me of one of the dinner scenes in “The Godfather”. Hmm….